Here is a simple and fun-looking nail art design for you. The 'creeping vine' comes from my days in high school where I would find myself so bored I would start drawing these vines going up all my exercise books. Needless to say my teachers weren't very impressed! 1. Paint your nails with your base coat to protect your nails from staining. 2. Paint your nails with your base colour and leave it to dry completely otherwise the design won't work properly! 3. To do the creeping vine, use your pen/striper to draw a line from the left bottom corner of your nail to near the centre. Then, draw some various sized lines coming off from each side. The trick is to make the lines coming out of other lines really random and at different sizes. Make sure most of them continue the cycle and leave one or two as they are. Continue this until you are satisfied with the look. 4. Making sure you have left your design to completely dry so the black lines do not smudge, paint on your top coat. There you have it! What do you think? Let me know if you recreate it! Hello! 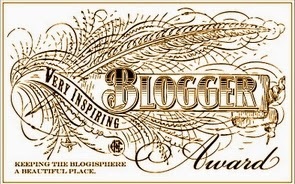 So I was surprisingly tagged in the Very Inpsiring Blogger Award by www.emilyatsunset.blogspot.co.uk. Thanks! 2. I am taking a gap year next year where I plan to travel and do some voluntary work for a mental health charity! 3. I am a dancer and have been the large majority of my life. I do tap and also used to do ballet. 4. I am the youngest of 5 siblings: four sisters and one brother! 5. I want to work with mental health and teenagers as a career. 6. Once I sent a photo to my male friend on Facebook and didn't realise I had underwear I had worn on the floor in the photo! I was severely embarrassed and couldn't face him for ages. 7. I have two crested gecko lizards which sometimes breed and we look after the babies until they are old enough to sell on. I am going to break a rule- I'm not sure of 15 other blogs to tag! However I will definitely tag www.emilyfrancesx.blogspot.co.uk and anyone else who would like to do it! Would I Repurchase This? Yes, 100%! 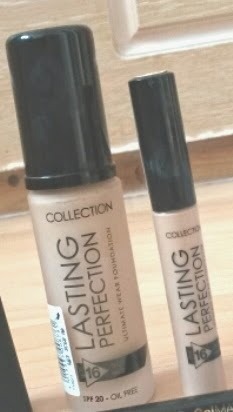 I have always used the concealer of this but didn't realise this foundation existed until about three months ago. Knowing how much I love the concealer I bought this foundation with high expectations! I was definitely pleased with it. I found it a bit hard to choose my shade but in the end I went with 'silky beige'. This didn't sound right for me because my skin colour really isn't 'beige' and when I brought it home even my Mum and sister said it probably way too dark for me. 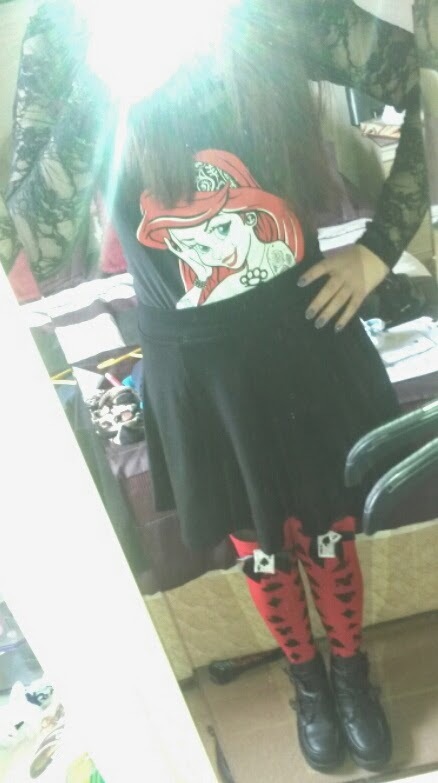 HOWEVER when I tried it on it matched perfectly! This foundation is a medium/high coverage foundation which I like as I suffer from acne/red scarring. This is perfect for my skin and hides blemishes and redness well. I find this foundation blends very well and doesn't make me look orange. Sometimes I find it kind of clings to the dry patches underneath my eyes which therefore may not make it suitable for really dry skin but it is barely noticeable, only to me. It does last all day I will give it that, but sometimes it can go a bit 'dusty' looking shall we say around the nose/on wrinkles after about 7 hours. However it isn't that big of a deal and can easily be fixed although it really is not that noticeable! Would I Repurchase This? Yes, always have done and always will! I have been using this concealer for many years now, perhaps four, but this is the first time I have used it since they have changed their brand, the packaging and shade names. I was a bit wary of it but when I eventually found my colour I soon realised it was just as good as it had always been. 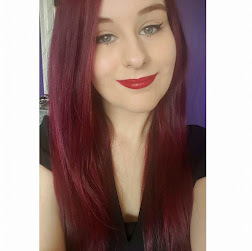 Similarly to the foundation, the name of the colour sounded way too dark for me but in actual fact it was perfect! I was also worried about it not blending with the foundation but thankfully it does. I have always loved this product because it is immensely good at covering up redness, acne and scarring as it is high coverage and blends well. 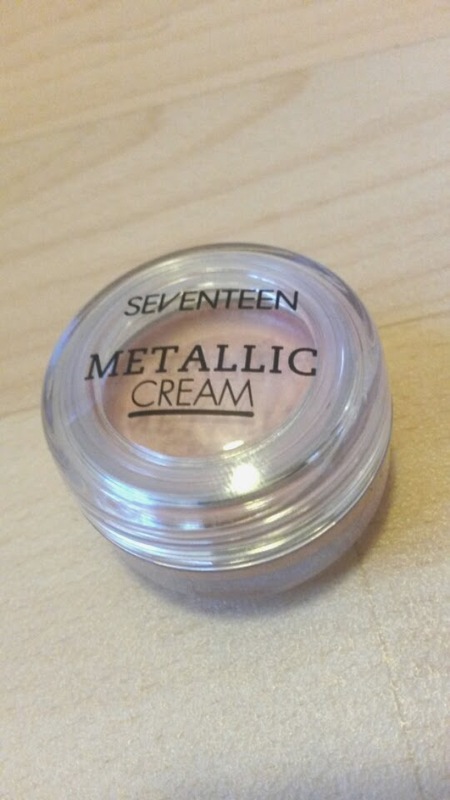 It is so good that I have only recently started wearing it with foundation! I always used to wear the concealer and the concealer alone which worked great. 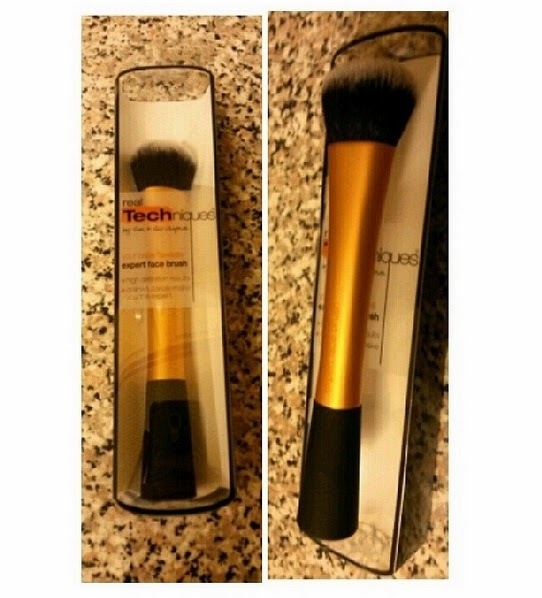 I would only use it where necessary and it still blended great with my natural skin colour. Overall I cannot recommend these products enough. I have been excited for a while to share with you the concealer as it is my ultimate concealer I have used daily for many years. I was quite young when my Mum came home with this to help cover up the horrible 'pizza face' I had at the time and let me tell you it was quite the self-esteem saver. I will forever repurchase these and would definitely recommend you try them out! 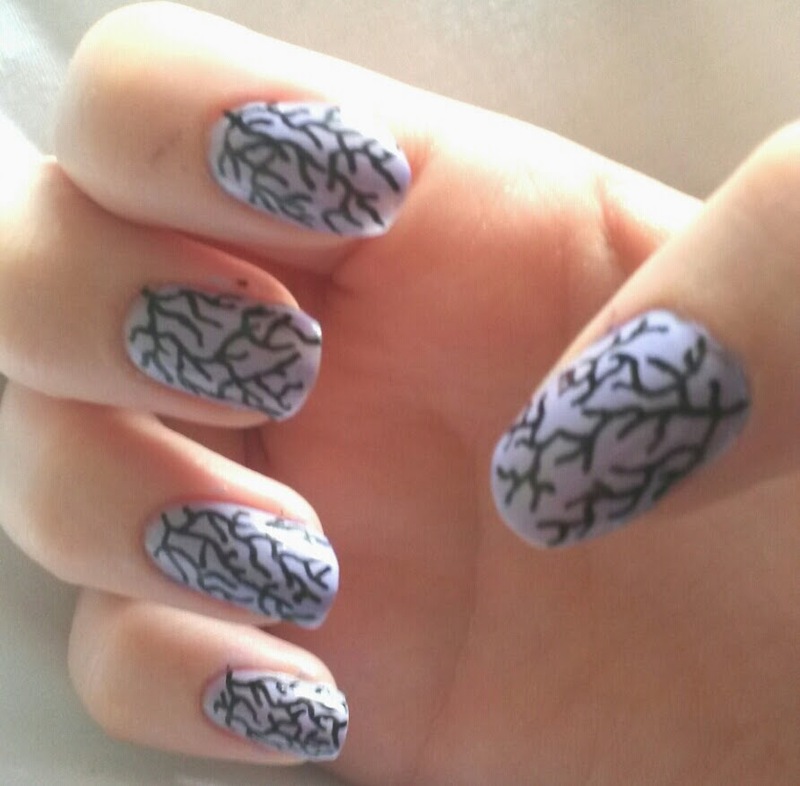 I did this nail design about a month ago and I would like to share with you how I did it as it is definitely in my top 10 of favourite nail arts that I have done and it received so many compliments. It is cute and doesn't take much effort or skill! 1. 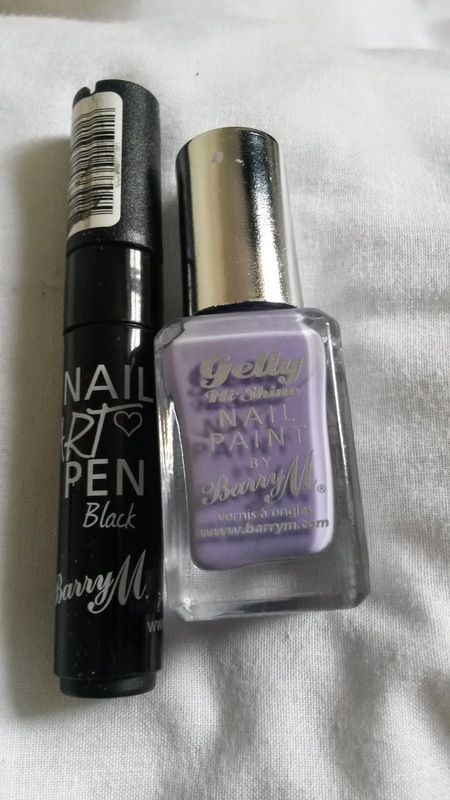 Paint on your favourite base coat to protect your nail and prevent staining from the nail polish. Let it fully dry. 2. Paint all your nails with the blue nail polish and let it dry. You may need more than one coat! 3. You can do this in two different ways, I found it was easier to do both ways depending on how small the nail was or on what hand it was! A) Keeping both wrists on your surface to give a steady hand, draw a medium thickness line across your nail. Then, draw two triangles that meet one another at the singular point to form a bow. Colour it in and leave it to dry. B) Draw two triangles facing one another with the singular point touching one another for the bow. Colour the triangles in then draw a medium thickness line coming out of each side. Leave it to dry. 4. Leaving enough drying time so the next coat doesn't smudge the design, put on your top coat. I recommend using a shiny one as it just adds to the cuteness of it! And there you have it! 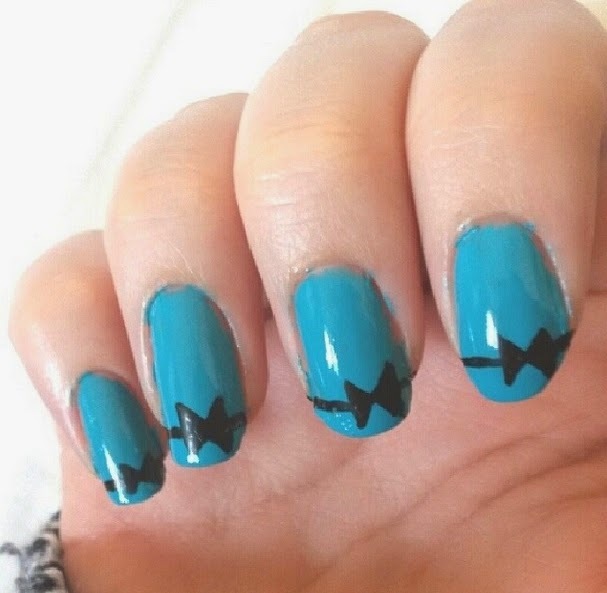 Lovely bow nails. I really recommend buying a nail art pen for this as it very similar to drawing with a normal pen so it is soooo much easier to use! You should also decide where you'd like to put the bow on your nails so they all look equal. Perhaps decide to put them all in the middle of your nail or on the left/right side. What do you think? Will you try it? Let me know! It is a moonstone quartz with a snake wrapped around it and I think it is beautiful! What's great about it is that it shines various pretty colours in the light and the snake just gives an extra quirkiness to it. 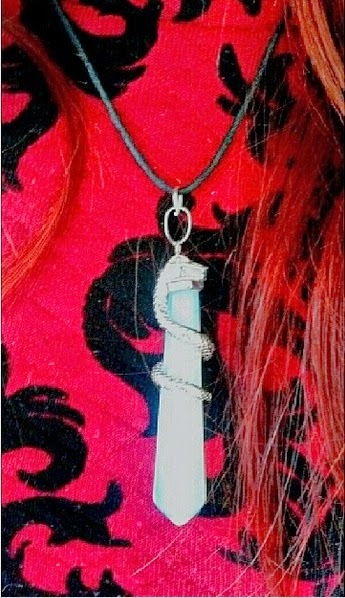 It was only £8.00 and you can either get it on a 16cm sterling silver chain OR on a choker like I did! There are some other beautiful, cheap pieces in this online shop and I am sure this won't be the last time I buy from them. 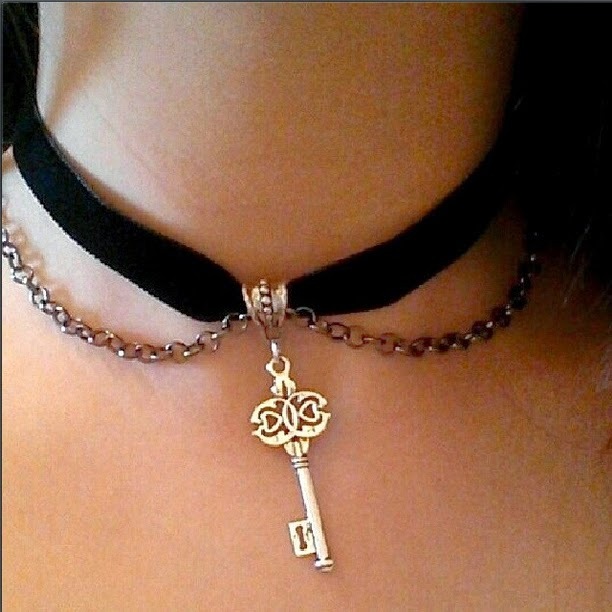 You can buy this specific one here. If you are as lazy, weak and as unmotivated as me, you may find it difficult to commit to exercising which can put you in to this continuous cycle of feeling bad about your body. 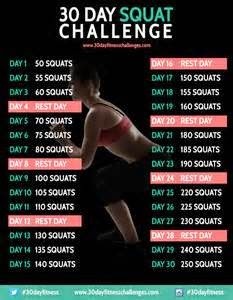 I HATE exercise, anyone who knows me would tell you that, so when I discovered the 30 Day Squat Challenge I was pleasantly surprised. In addition I also have scoliosis (a curved spine) along with very poor back and stomach muscle. This means that I am much weaker than I should be and my muscles do not support me very well therefore leading me to really struggle with exercise. However none of these problems were affected by this challenge which I was grateful for! This is a plan you can follow for an entire month. It's easier to begin at the beginning of the month so then you can easily keep track of what day you're on. It starts off easy and slowly builds you up to do more. The good thing about this challenge is that it doesn't take too much effort. I did my squats just before I went to bed whilst I watched TV so it didn't take any sacrifices or commitment. I also never worked up a sweat which was nice. If I can commit myself to a month of this, then trust me so can you. This has been the only form of exercise apart from my dancing that I have ever stuck to and didn't give up on! By the end of the month I felt really proud of myself for sticking to it and I was so pleased that at first I could barely do 10 squats but now I can push through! I noticed my legs and bum looked more toned and my muscles were getting stronger. This has been a real confidence boost for me and I highly recommend it, from one lazy and weak person to another! Have you tried this 30 day challenge? What do you think of it? Will you do it? Let me know! My birthday was on Thursday but I didn't do anything until Friday and Saturday. 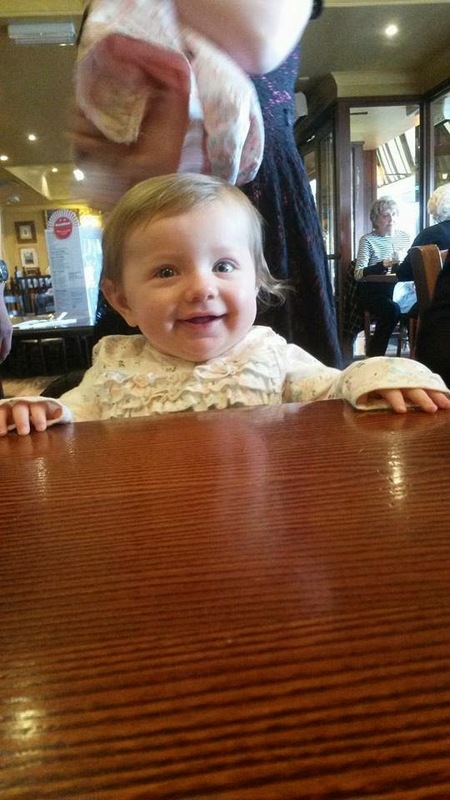 I went for a meal to Bella Italia with my friends Emily (www.emilyfrancesx.blogspot.co.uk), Ruby (www.dearrubyx.blogspot.co.uk), Robyn and Antonia. It was a lot of fun and I ate tomato pasta with cookie dough and ice cream for dessert! 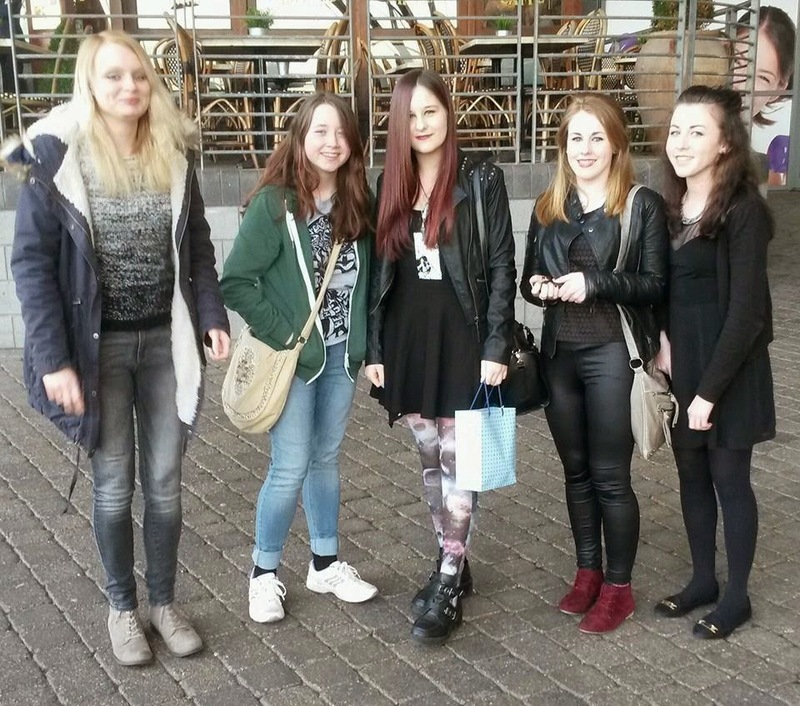 Afterwards, we went to see the film Divergent! We are all pretty die-hard fans of the books so for months we had been waiting for that day! We saw it the first day it came out in the UK and I'm pretty sure we nearly hyperventilated in the cinema. It was super good and we are planning to see it again soon. It sticks to the book quite well and definitely lived up to the standards I set up for it! I seriously recommend it whether you have read the books or not. I went to Bella Italia AGAIN (you can tell I like it, right?) with my family, There were 10 of us so it was a pretty big do! 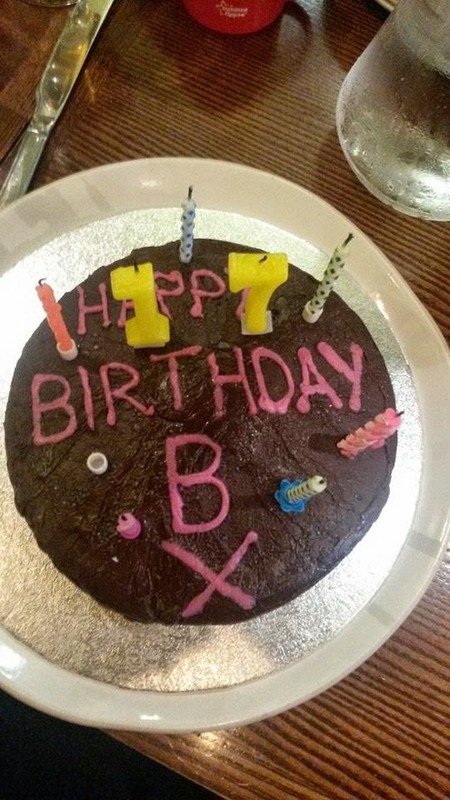 It was lots of fun and my sister Kimberley surprised me by baking me a cake (shown above) which the waiters/waitresses carried in with lit candles on with everyone singing happy birthday! The cake was extra special as it is a recipe me and my sister used to make together ALL the time for every occasion until she moved out and had my niece. Slightly embarrassing. The funny part was that one of the candles was a trick candle that after you blow it out lights itself back up again! I had a great birthday and I really appreciate all the things my family and friends did for me to make it special. I love you all! Have you seen Divergent or are you planning to? 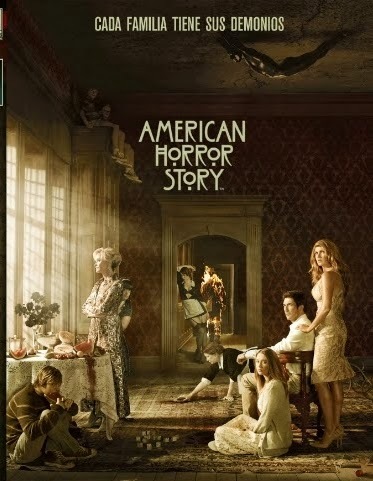 What do you think of it or the books? Let me know! 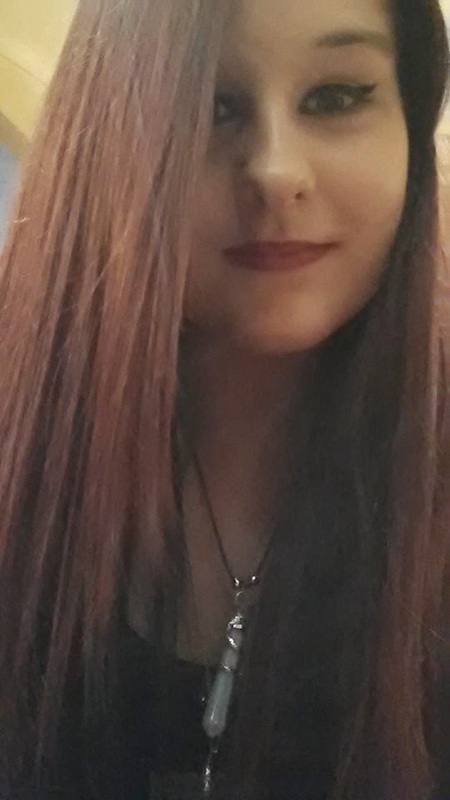 So on the 3rd of April I turned 17! 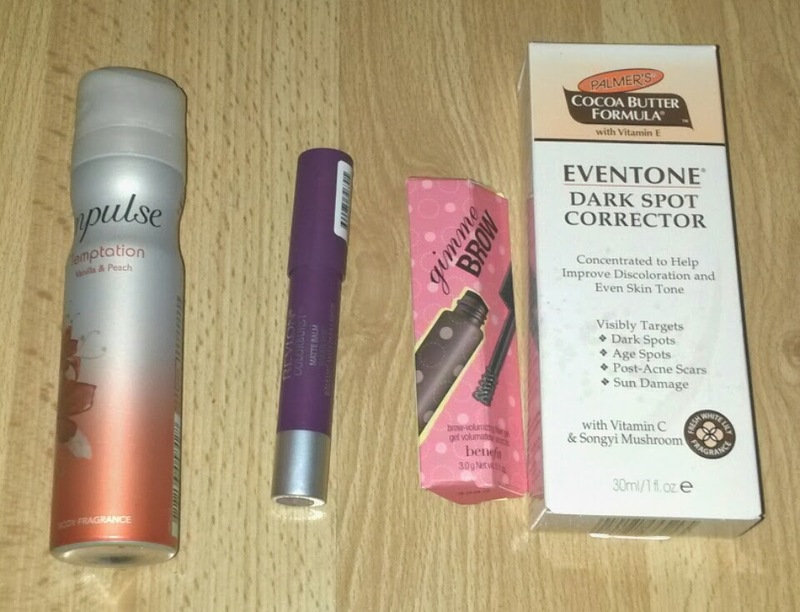 I decided I would make a blog post about what I received from friends and family as if it were a haul. I am still yet to receive presents from my boyfriend, brother and uncle but this is the majority of it. Also, sorry the photos are pretty rubbish quality but I took them late at night as I knew that would be the only change I could get to take the photos. But the most important and rather unique present was that I found out I am going to be AN AUNTIE AGAIN! My sister rang me up and said "do you wanna know something interesting?" as I replied what she said "I'm pregnant!". I thought she was joking at first as if it were a late April Fools joke but alas she was being serious. At that point I cried! Certainly a birthday present I never thought I'd receive. DVDs: Chicago (musical), Catching Fire and The Mortal Instruments: City of Bones. I love these films and got them from my Nan. 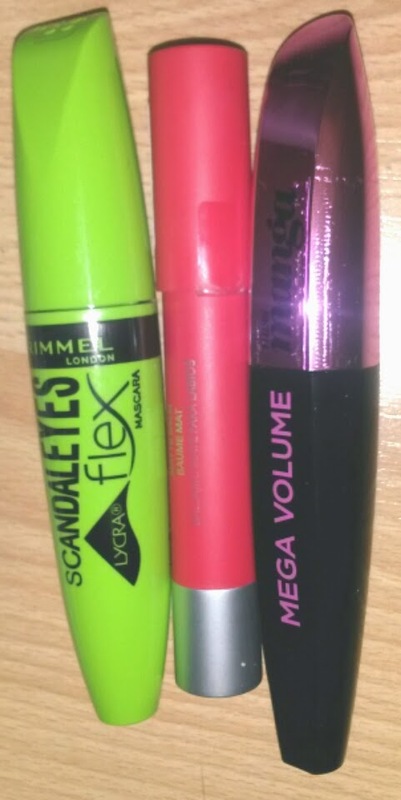 Scandalous Eyes Flex mascara (from my friend), Revlon Matte Lip Crayon (Cannot remember the colour but it is a bright red from my mother) and L'oreal Manga Mega Volume mascara (Also from my mother). Babyliss Keratin Waves received from my sister Kelly. I don't ever put curls or waves in my hair so this should be interesting! The first three, the 60 seconds ones, are pastel colours from Toni. 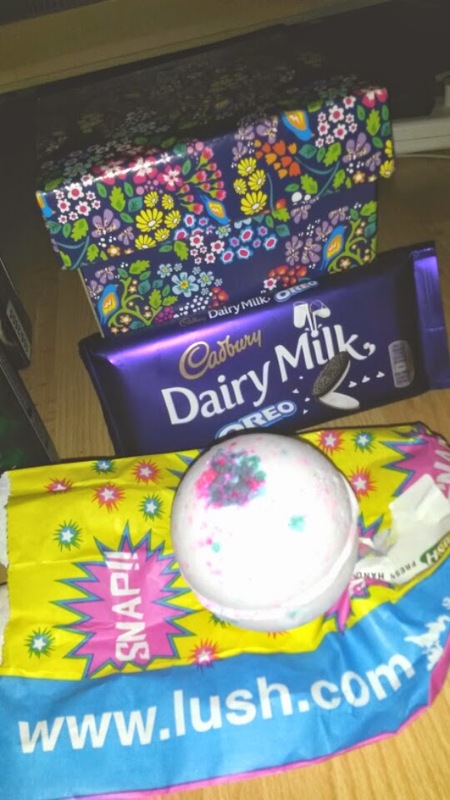 The Colour Show graffiti one is from my friend Vicky and the Models Own ones from my mother. They include hypergel, speckled eggs, a top coat and sticky fingers. Posts on them will come soon! 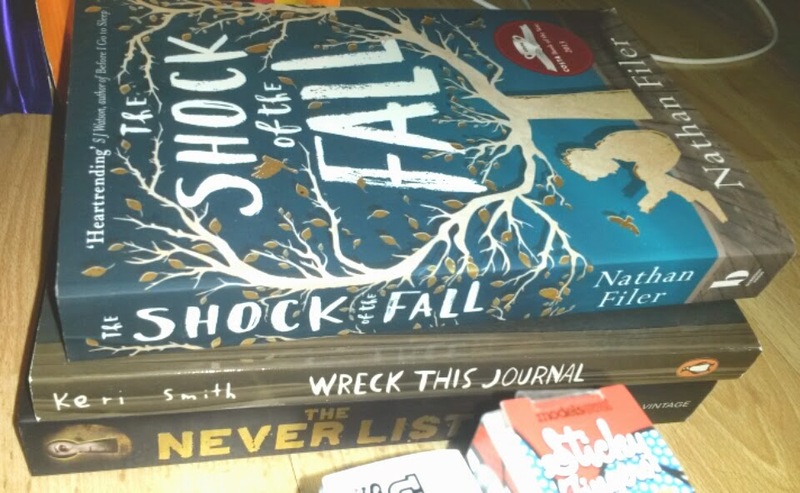 Shock of the Fall and The Never List are from Emily and Ruby. However I've already read Shock of the Fall so they're going to let me return it and choose a new one. I also got Wreck This Journal which I am planning to turn in to a series on this blog soon from my friend Robyn! 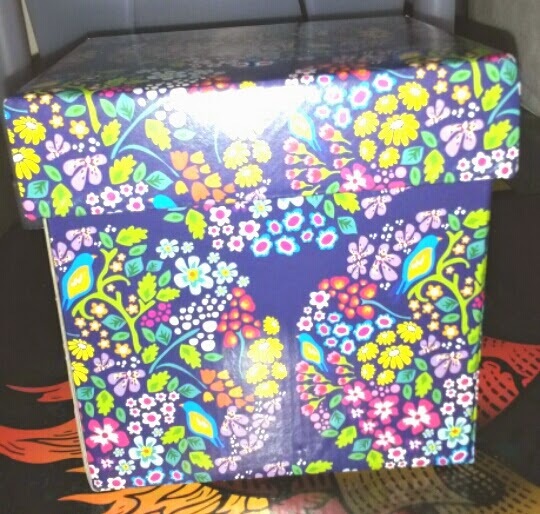 This is the 'Gorgeous' gift box by Lush from my sister Lisa. An unboxing and first look post will be on its way soon! 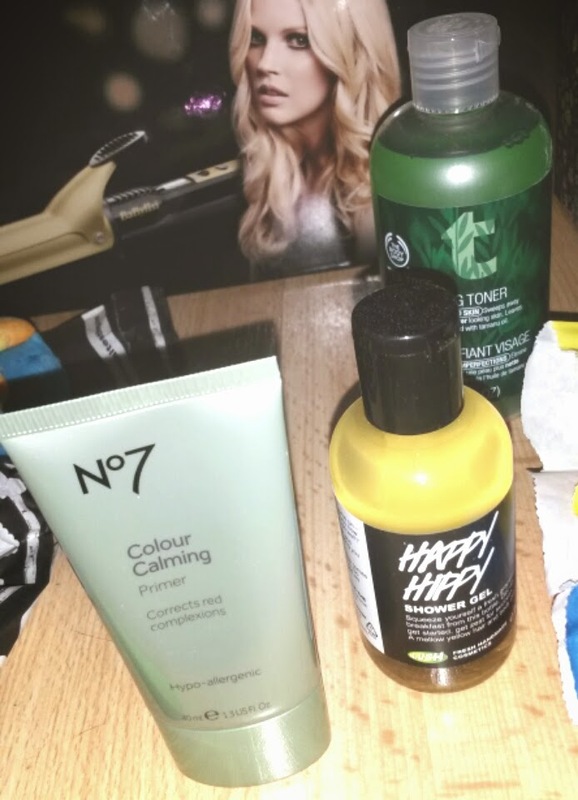 The Body Shop Tea Tree Toner and No7 Colour Calming Skin Corrector from my mother and Happy Hippy shower gel by Lush from my friends Emily and Ruby. 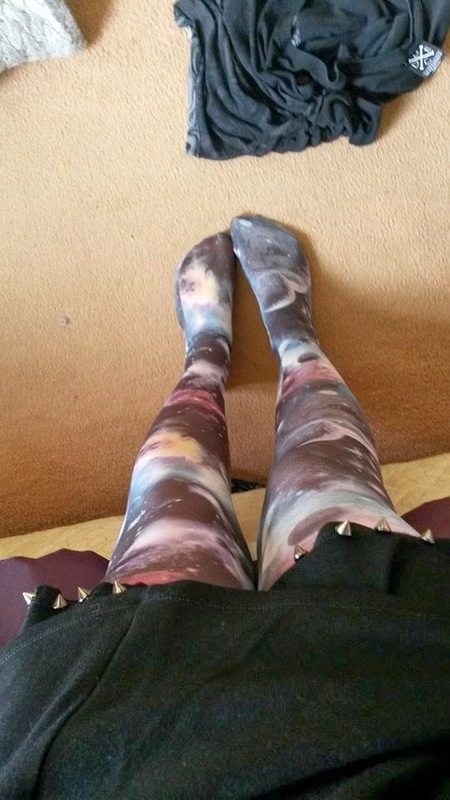 (www.emilyfrancesx.blogspot.co.uk and www.dearrubyx.blogspot.co.uk) Reviews coming soon! When taking these photos I forgot the clothes I received from my sister Kimberley, her boyfriend and my niece. They bought me a white top with black bows all over and a pair of black high waisted trousers with 3 buttons on them. Super nice! I mostly got money for my birthday to spend on what I'd like. So those were my birthday presents! I will make a second post showing what I did for my birthday if that interests anyone which should hopefully be up tomorrow.